I have concerns about the aluminum content in our public water supply. Our public water treatment facility uses aluminum sulphate as part of their treatment process. I know this is a common practice but I have concerns about aluminum and the possible connection to Alzheimer's, although the reviews are mixed regarding the aluminum/Alzheimer's connection. I am not sure if the residual aluminum from the water treatment process is significant for concern. The aluminum levels are not listed in our Annual Water Report. I also learned that fluoride in water can actually increase the uptake of aluminum, especially as you get older. The more I research, the more confusing the information as to what is the best way to go. Mineral water, purified/distilled water, filtered water, or just keep drinking the tap water? I know it can be confusing. I will share a few insights from my own research and personal experience. First, I agree that a large amount of aluminum intake may have an adverse effect on health. Excess exposure is related to nerve damage, allergies, and is believed to be carcinogenic. Some of the studies documented in this same report found a correlation between aluminum uptake and Alzheimers disease (AD), while other studies did not. The Environmental Health Criteria document for aluminum (WHO, 1997) concluded that "the positive relationship between aluminum in drinking-water and AD, which was demonstrated in several epidemiological studies, cannot be totally dismissed. However, strong reservations about inferring a causal relationship are warranted in view of the failure of these studies to account for demonstrated confounding factors and for total aluminum intake from all sources." This disclaimer actually makes sense when you compare the amount of potential exposure to aluminum in water compared to exposure from potential food sources and medications, as noted below. 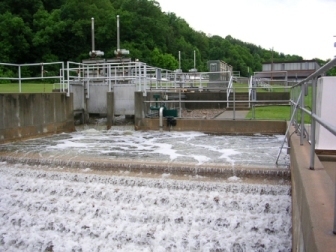 According to the same study, aluminum salts are used in water treatment as coagulants to reduce turbidity, microorganism levels, and other organic matter. I don’t know if this process is fully regulated in the U.S. However, in one U.S. survey, the average aluminum concentration in treated water at facilities using aluminum sulfate coagulation ranged from 0.01 to 1.3 mg/litre, with an overall average of 0.16 mg/litre. (Letterman & Driscoll, 1988; ATSDR, 1992). According to the WHO report: "Aluminum intake from foods, particularly those containing aluminum compounds used as food additives, represents the major route of aluminum exposure for the general public, excluding persons who regularly ingest aluminum-containing antacids and buffered analgesics, for whom intakes may be as high as 5 grams/day (WHO, 1997)." Compare that to an average adult intake of aluminum from food of 5 milligrams/day and a drinking-water aluminum concentration of 0.1 mg/litre, the contribution of drinking-water to the total oral exposure to aluminum will be about 4%. The contribution of air to the total exposure is generally negligible. Aluminum can be removed from water by several methods, including reverse osmosis, distillation, as well as ion exchange. Ion exchange is highly effective for removing aluminum, as well as heavy metals such as lead and mercury. If you have read any other articles on my site about the best drinking water, you probably know that I do not recommend drinking demineralized water (such as reverse osmosis or distilled) for long-term, daily use. If interested, you can read details on this page: Drinking Demineralized Water – The Health Risks. Therefore, I think the best choice for removing aluminum is to use a home water filtration system that uses an ion exchange media as part of a multi-stage filtration system. ﻿Aquasana’s drinking water filters﻿ do use ion exchange, and I highly recommend these systems for a number of reasons, including the fact that they remove most adverse contaminants without removing the naturally occurring minerals in water. The only downside of these systems is that they do not remove fluoride. ﻿Crystal Quest has drinking water filters﻿ that use the ion exchange, as well as a specific media that filters fluoride. These water filters also leave in the naturally occurring minerals in water. I believe these are some of the best drinking water filtration choices on the market, especially for the price. For those who are firm believers in reverse osmosis, I highly recommend purchasing a system that includes a remineralization cartridge or tank. Aquasana also offers this option in both whole house and drinking water filters. ﻿These water systems include reverse osmosis, ion exchange, and remineralization.﻿ The biggest advantage of a multi-stage system that also includes reverse osmosis is that RO removes about 95% fluoride. In summary, I do believe there is a connection to Alzheimer's disease and other brain disorders from aluminum intake. I don’t believe the amount of intake of aluminum in water from public water sources is the biggest concern. Commercial processed foods as well as certain drugs such as analgesics and antacids have a much higher concentration of aluminum than treated water. However, I don’t want to minimize the importance of reducing all metal exposure because the effect is cumulative throughout our lives. Thus, reducing intake of the foods and drugs mentioned that have the highest sources of aluminum, as well as removing aluminum and heavy metals from drinking water is necessary for optimal body and brain health. I did not find anything conclusive about fluoride increasing the uptake of aluminum. However, if fluoride is added to one’s municipal water, it is always a good thing to choose a water filtration system that removes it for many health reasons.